An amazing sunrise on the lake this morning in Foss State Park on the western edge of Oklahoma. But the heat and humidity made it less than comfortable to linger, despite the beauty. We broke camp and quickly loaded the jeep, heading out in search of Foss, the ghost town we had heard was nearby (see more about visiting Ghost towns). We followed the directions, however, in place of a “ghost” we found a thriving — if very small — town. Apparently “ghosts” can be revived! 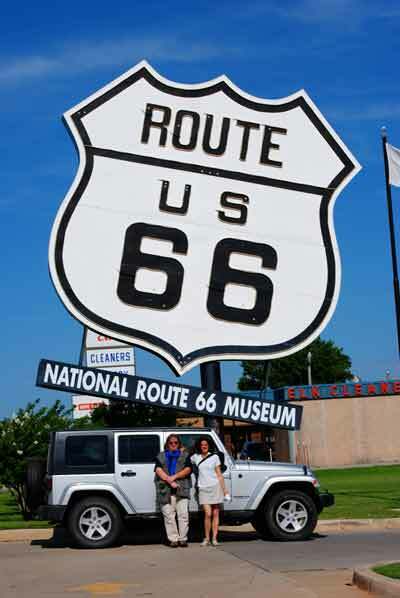 Back on Route 66 we continued westward, stopping in Elk City, at the National Route 66 Museum for a chance to stretch our legs and photograph the Jeep in front of the giant Route 66 sign. The building and grounds were designed to replicate the style of an old western town, and there were a few giant kachina sculptures outside. Inside we learned that it was actually a group of four separate little museums, only one of which was dedicated to the Mother Road. We had kind of expected a “National” Route 66 museum to be larger and more comprehensive, but we still took a look around and added some postcards to our growing collection. We rolled into Texola after noon. The thermometer said it was 98 degrees. The streets were hauntingly empty. This wasn’t supposed to be a ghosttown, but there was little sign of life. We stopped the Jeep and got out to explore. 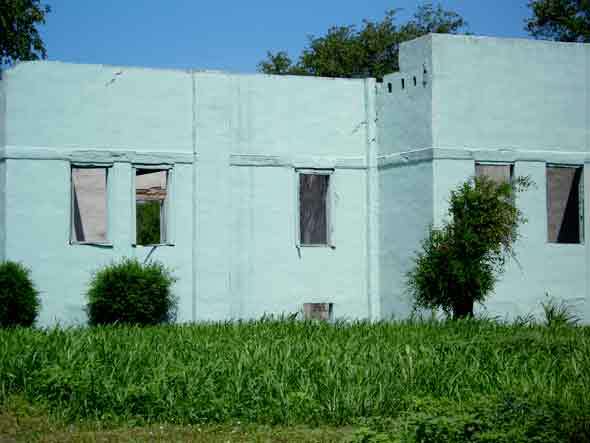 Walking carefully among the shattered homes we saw what might have once been a school — painted bright aqua blue — its walls still standing, but roof open to the sky, and vegetation growing up inside the ruin. Dogs barked in the near distance. The sun was high in ths sky, and the grass and weeds were high too, overtaking the sad crumbling buildings. Remnants of lace curtains on the porch windows, old paint cans on the floor. It looked as if some kind of catastrophe befell the town and everyone fled to some refugee camp across the border. Except they didn’t. They just left. Little by little. Or they died. Peacefully of old age. And the artifacts of their lives remain here just as they were on that last day. Half finished chores. Clothes pins on the line. Frozen in time just like the people of Pompei. 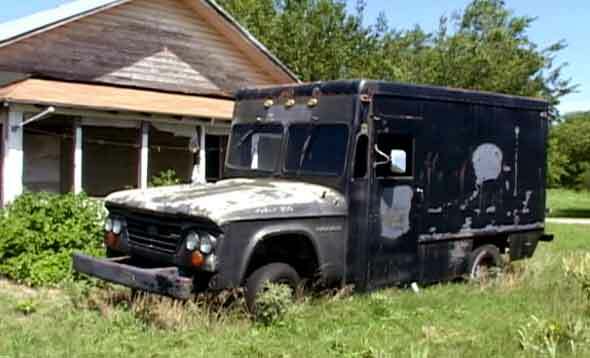 Last remnants of so many forgotten American Dreams out here on the edge of what was once the frontier, but is now just a shadow of a town on a map. 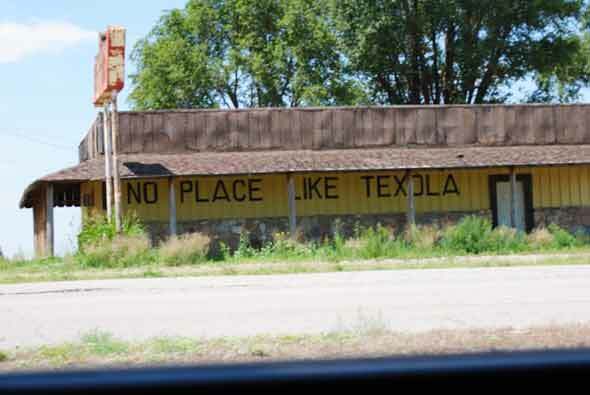 It wasn’t supposed to be a “ghost,” and yet here it stood, “No Place Like Texola” painted in a twisted irony of fate on a building that sits empty and sagging — a small town’s pride surviving the town itself. An expression of hope or quiet desperation — we will never know which, as there were no people to speak with. No one left to recount the history of this place, or what happened to its people. This entry was posted on Friday, July 16th, 2010 at 9:39 am. It is filed under Notes from the Road and tagged with adventure, driving, foss, ghost town, impressions, jeep, museums, oklahoma, postcards, road, road trip, route 66, texola. You can follow any responses to this entry through the RSS 2.0 feed.